Deniz Güzel wrote about Dayanita Singh's exhibition "Go Away Closer." Güzel is one of the founders of Fotomat which is not in publication anymore, and one of the curators of K2 Contemporary Art Center. Doing her masters in the history of photography in London at the moment, Güzel will appear in Orta Format's updates with her essays. Born in 1961 in Delhi, Singh studied visual communication at the National Institute of Design in Ahmedabab, and photojournalism at ICP (International Center of Photography). Although she met the gallery/biennale audience frequently recently when her works was shown in Germany pavillion in Venice Biennale and Frith Street (London), she usually prefers to publish her photographs into books. It is possible to say that her works are more accessible through this preference. Her exhibition "Go Away Closer" serves as a retrospective in terms of its embodiment of her latest work "Mona and Myself", all her published books and a far-reaching anthology of her early works. The punctum  or the heart of the exhibition is the museums exhibited together in a grand room. They are eight: "File Museum", "Little Ladies Museum 1961 Present", "Museum of Chance", "Museum of Embraces", "Museum of Furniture", "Museum of Macfines", "Museum Men- Recent" and "Museum of Photography." These museums are designed in different forms (and dimensions), made up of teakwood lodging photographs of different sizes and numbers. Singh, by installing her photographs in museums without walls she built into the gallery instead of the gallery walls, creates an imaginary museum archive, a visual memory storage, rather than a photographic appraisal or an artistic expression. When I look at photographs, I usually find myself thinking about John Szarkowski's (1925-2007) five principles. Singh's works take a stand against all interpretations of "the thing itself" and uses photography not as the thing itself but as archive material of purpose built museums which resembles a labyrinth in the exhibition space, limited in respect to its subject matter. A furniture museum consists of various furniture photographs, when a photography museum consists of photographs of photographs that are sometimes hanged on the walls or sometimes held by a model within their respective compositions. In Singh's works photography is an object of memory and archive; and memory is Mnemosyne. The children of Mnemosynes are Muses. Museum literally means "shrine of Muses;" shrine of inspiration that are children of memory. In these photographic museums, museum objects that are photographed and the absence of the museum itself, ascribe a two-layered representational dimension. 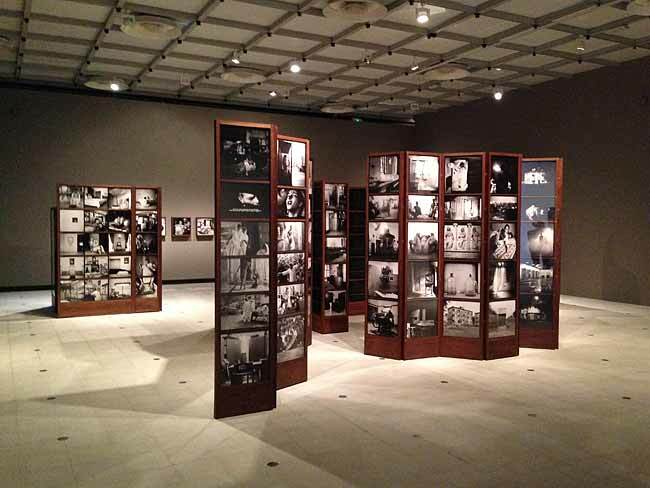 Whereas photographs represent objects, panels represent museums. Perhaps Singh tries to fill the gaps art and cultural politics fail short in terms of third world countries' approach to subjects like archive and collective memory with her own photographic museums as an artist and becomes both the artist and curator of the museums she designed by herself. If you like to see an artist who uses photography instead of being a photographer herself, I recommend you to spare 2-3 hours to this exhibition until December the 15th. Maybe you get to recall Borges when you are strolling through a labyrinth, and see Alef in one of the museums. Notes: The entrance fee is a bit expensive, GBP11 for adults and GBP8 reduced fee. An exhibition brochure edited by Stephanie Rosenthal was published. You can also find the books Singh keeps at her own library in gallery's bookshop. One of these books is Orhan Pamuk's "Museum of Innocence."